Before dancing hamsters, Godwin's Law, and free AOL CDs in the mail, pot-stirring Internet trolls were sowing discord and starting flame wars on early message boards. More recently, the rise of social media has given them one more platform on which to troll the Internet masses. 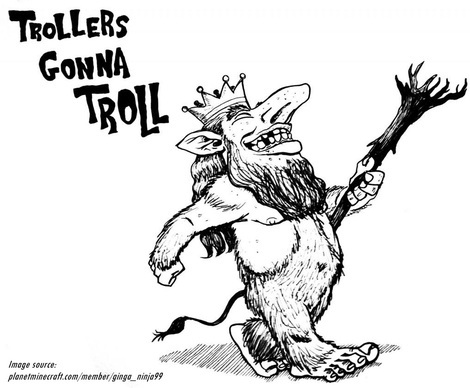 If you think you are being trolled, check out these tips for spotting and dealing with social media trolls. A social media troll, by definition, is someone who creates conflict on sites like Twitter, Facebook and Reddit by posting messages that are particularly controversial or inflammatory with the sole intent of provoking an emotional (read: angry) response from other users. These messages are often distracting and take focus away from the subject at hand, sending a rational discussion down a rabbit hole of obscenities, personal attacks and jokes about your mom. If you are the target of a troll, don't worry! There are things you can do to get the troll to lose interest in you and go away. Bigger companies hire social media marketing companies to handle their accounts -- including the trolls, because they understand that social media, is a 24/7 venture that never sleeps and needs to be tended. If you manage your own, following these easy tips can help you to get rid of trolls and restore peace on your social media accounts. Ignore them. People troll for both attention and the personal satisfaction of getting a rise out of someone. It's the same reason kids throw fits and pick on their peers. As with tantrum-throwing children, it can help to ignore trolls if there is only one or a few. Deny them their life source and they are likely to go off and find someone else to troll. However, do take note that this approach can also backfire. By staying silent you may just unleash an avalanche of trolling since no one is "reading this" anyway. If you have to respond, kill them with kindness. Sometimes, inaction can be worse than ignoring someone entirely. And even if you ignore a troll, your friends and followers might not. If they take the troll bait, try to jump in and squelch the situation before it gets out of hand. Respond quickly, gracefully, and respectfully. Thank the troll for his or her opinion and move on with your life. Hopefully he or she will, too. Don't try to fight fire with fire. Trolls have a back stock of low blows that they have no problem whipping out at any time. Remember, if you respond to a troll with equal malice, you'll only be damaging your own image and reputation. The more you respond to a troll, the more motivation they have to continue stirring the pot. By being polite or ignoring them all together, you are refusing to add more fuel to the troll fire. Do not try to engage trolls in a rational conversation. They're agents of chaos -- no more, no less. Trolls don't troll to start an open-minded discourse about complicated issues; they exist solely antagonize and start fights. Logic bounces off of them like rubber balls shot out of a potato gun. Trying to reason with a troll is a waste of time -- yours, not theirs, because they obviously have little else to do. Terrible people exist all over the world. It's a sad fact of life. And unfortunately, the Internet has given those people the ability to spread hate and malice with almost no real-world repercussions. Some people feel like they can say whatever they want to whomever they want on the Internet because they don't have to deal with the immediate consequences of mistreating another person. Thankfully, this goes both ways. Online, it's easier than ever to ignore someone's hateful remarks and walk away. Unlike reality, where we are frequently forced to interact with people we don't like, you can ban trolls from your social media accounts and never think about them again. If you find yourself the target of unnecessary vitriol on social media, remember this easy advice: don't feed the trolls.